During these chilly Spring months, one of the best hot treats is a nice cup of coffee with a minty freshness to it. Unfortunately, after trying the best mint around, it’s hard to settle for anything less. Those synthetic mint flavors just won’t do! Many coffee lovers have shared their experience and knowledge with us, and after several suggestions for us to share this information with our customers, we have decided to reveal this age old secret. This will work with any type of coffee, hot chocolate, and potentially other hot beverages. 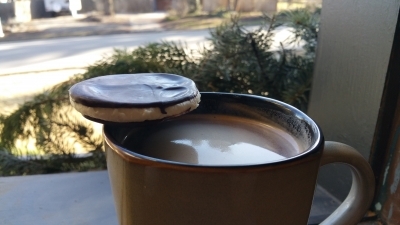 Once your drink is ready, and you are tuned, focused, and one with the mint, pick up a peppermint patty, break off a half, and dunk it into your hot drink! After stirring steadily for thirty seconds, your drink will have transformed from a typical drink, into refreshing minty goodness! For different results, try putting either a quarter of the peppermint patty in or even the entire thing based on your taste.